It was my good fortune to witness, during my years in India, the introduction of a truly Indianised liturgy. The liturgical reforms initiated by Vatican II took hold in India as in no other part of the world. It was a joy to be part of it. 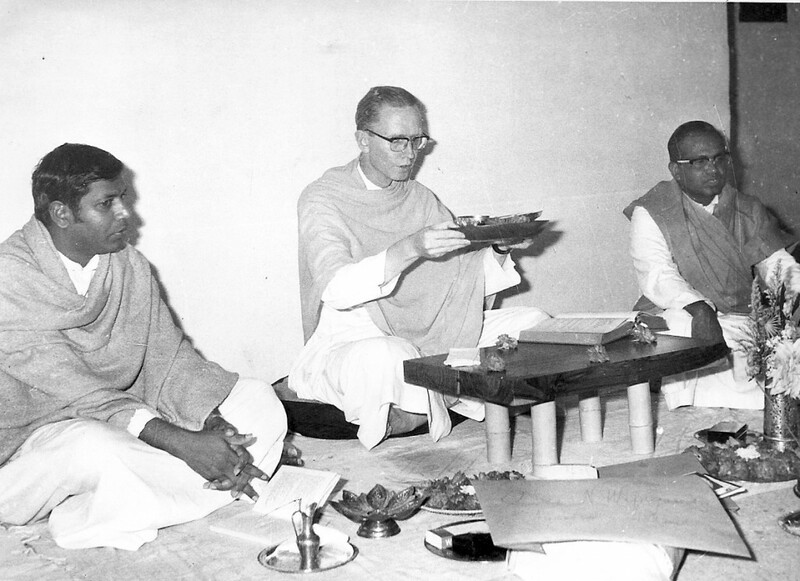 I myself presided over indianised masses on numerous occasions: during my weekly Sunday celebration in an outstation of Ramanthapur parish, in eucharists celebrated with groups of students in the seminary, in Amruthavani chapel and in places of worship all over India where I had been invited to conduct retreats or give courses. But what do we mean with an ‘indianised’ mass? To help clarify the situation, I will first sketch how it was and is conducted. The indianisation did not affect the substance of the eucharist: the readings from sacred scripture, the intercessions, the offertory, the prayers of consecration, holy communion and so on. Indianisation only affected cultural forms of expression. The congregation does not sit in pews. 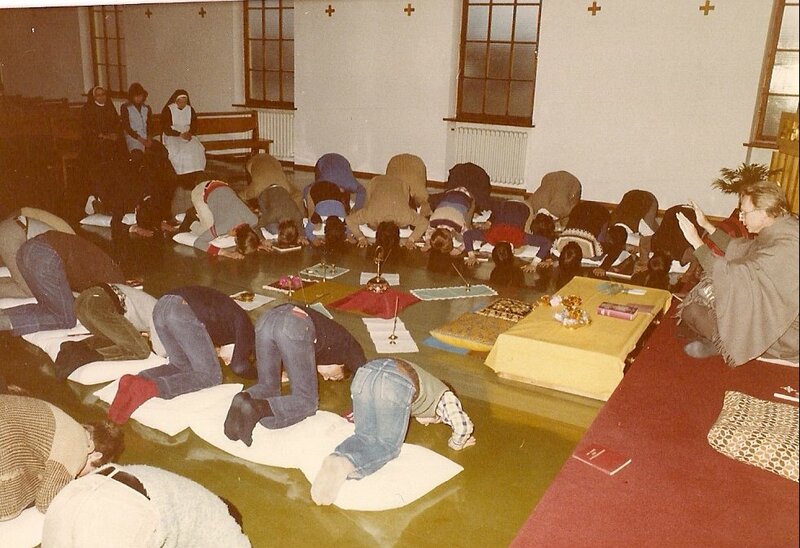 People sit cross-legged on the carpeted floor facing a low altar table. Behind the altar table lies a cushion on which the celebrant will sit during mass, facing the congregation. Presiding at mass I am lifting the tray with bread and wine during the offertory. When the priest enters, he is welcomed with the traditional signs of greeting a guru. A woman acting as hostess garlands him with flowers as a representative of Christ and honours him with arati. This is a traditional gesture which involves her waving a tray covered with flowers in front of the priest in a circular motion. The priest, who is vested in a white alb and a saffron shawl, bows to her and the congregation before taking his seat on the other side of the altar table, facing the people. The penitential part of the Mass involves ritual ablutions and sprinkling of water. To underscore confession and forgiveness, the congregation will be invited to make a panchanga pranâm, a full prostration with forehead touching the ground before the knees, during which the priest gives the absolution. The reading of God’s Word is begun by the hostess lighting the bronze Indian oil lamp, the deepam, that has been placed in the centre, right in front of the altar table. While the five wicks are being lit, the congregation will invoke Christ as the light of the world. In fact, the lamp represents Christ, and its light represents the word he conveys through the inspired scriptures. After the readings, the sermon and the prayer of the faithful, gifts are brought up to the altar by members of the congregation. Apart from bread and wine, coconuts and trays with flowers will be offered which are traditional Indian presents. Here interesting variations could occur. During my Sunday mass in the Moosi outstation, the children would come up one by one, placing a flower on the tray as they spoke a personal prayer of petition. On one occasion, I recall, a small baby came trundling up at the end of the queu, holding up a flower to me as she called out: “Tâta, tâta!” Tâta means ‘grandfather’. It moved me. To continue my description: after arranging the bread and wine, the priest takes the tray of flowers and decorates the chalice and paten with eight flowers, placing them on the altar in a circle round the sacred vessels in harmony with the eight directions of space. Throughout the eucharistic prayer, the congregation remains seated. However, special attention is given to the doxology at the end. The words of the doxology are accompanied by a special ritual of adoration. This consists of throwing incense on a brazier with glowing coals so that a cloud of smoke arises. Flower petals are strewn and arati is performed with a dish containing flowers and a small oil lamp. The whole congregation will make a profound bow or a full prostration. I am offering the tray with consecrated bread and wine, the communicant takes communion herself. People exchange the kiss of peace by folding hands, bowing to one’s neighbour and gently touching his or her hand with the tips of one’s fingers. The celebrant distributes holy communion, divyasatprasâd, on a tray which contains two bowls: one filled with hosts thus serving as ciborium, the other bowl filled with wine serving as the chalice. The communicants will take a host and dip it into wine to give themselves communion. On the same tray, flowers have been arranged so that, if any member of the congregation does not wish to receive communion, he or she can take a flower instead, simple prasâd. This accords with the Indian sense of hospitality, according to which no guest may be sent away empty-handed. After communion, a devotional bhajjan may be sung. The Indian blessing is longer and incorporates more ornate language than we are used to in our Roman liturgy. At the end of the mass, a coconut may be broken and shared among the participants. The priest will take leave after bidding the faithful to come back for another celebration. In India, no guest is sent home without a new invitation. The above description of an Indianised Mass corresponds to one particular form of celebrating it such as I myself frequently used when presiding at the Eucharistic meal. Slightly different forms were in practice in other parts of India. It is not difficult to see that in such a celebration of Mass the essentials have remained untouched while the external expression of these essentials has been adapted to Indian culture. Postures, gestures, symbolic acts, vestments, sacred vessels and other externals are translated into forms meaningful to the Indian mind. Permission to effect such changes was officially requested by the Indian Bishops’ Conference in 1970 and was granted by Rome. The introduction of indianised forms of expression was left by the Bishops’ Conference to the individual bishops. Having travelled far and wide through the country and having taken part in many national meetings with liturgists and catechists, I can witness to the fact that the new indianised mass was well received and welcomed in a majority of dioceses. Those communities especially that are more aware of their Indian origins or in areas where evangelisation is going on, have gratefully made the new forms of expression their own. It is difficult to describe the thrill and deep devotion with which an Indian congregation can worship Christ through its own cultural language. I am convinced that for many it has already led to a more authentic Christian prayer, to spiritual growth and a deepening of awareness of Christ and His Gospel. However, the new forms of expression also met with opposition. 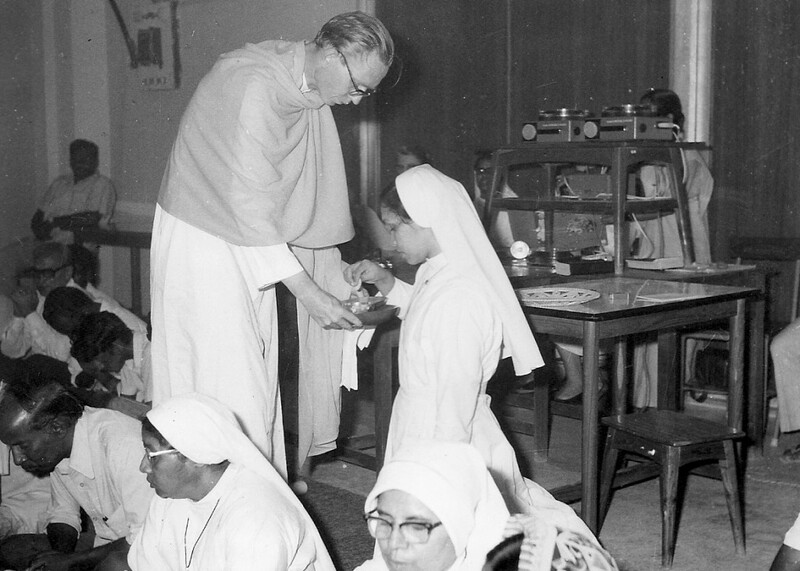 During my time in India two groups emerged as blocks of resistance to liturgical change. One group was formed by Catholics in major cities, who were either ‘westernised’ or who formed such mixed communities that they could no longer identify with a particular culture of India. Another group was formed by traditional Catholic communities in the South, where the force of established custom could not easily be overcome. Westernised Catholics fought indianisation because unconsciously, they identified themselves with Europe. Traditionalists maintained that accepting the traditional forms was part and parcel of accepting Christianity. Prostrating or ‘bending the knee’? Allow me to work out some examples. To the ordinary Indian, genuflection, that is: bending one knee, is as strange a gesture as standing on one’s toes or scratching behind one’s ears with both hands. It is a meaningless gesture and has no cultural connotation of worship. However, a profound bow with folded hands or a full prostration immediately conveys the message of worship or adoration. The posture, that expresses sacrificial participation, is not kneeling on both knees as we do in the West. The right posture is sitting with crossed legs and folded hands. It seems logical, therefore, that genuflection and kneeling should be replaced in India by bowing, sitting with crossed legs and the full prostration. Students of Absam seminary, Austria, prostrate during an Indian Mass I celebrated for them. Notice that there is no theological reason why we should insist on genuflection and kneeling. We know from Church history that in the early Church people bowed and did not kneel. Only in the eleventh century was genuflection introduced under influence of medieval customs at court. A knight would ‘bend the knee’ to express submission to a king. Genuflection first entered the liturgy as an act of adoring the blessed sacrament when it was exposed, and only as late as the sixteenth century did it enter mass. But traditionalists failed to see or recognise such distinctions. Bishop Ignatius Gopu was bishop of Vishakapatnam at the time. He forbade the indianised mass in his diocese. In a meeting of the bishops’ conference of Andhra Pradesh to which I had been invited as an expert, I had an argument with him. “Genuflection is prescribed by scripture”, he said. “Where is it prescribed in scripture?”, I challenged him. “Well”, he said, “in the Gospel of St Matthew we read that when the Magi found the child Jesus in Bethlehem, ‘they knelt down and worshipped him’ (Mt. 2,11)”. He refused to withdraw his argument. For him genuflection and kneeling were an essential part of traditional Catholic worship. As far as I could judge, the Church in India was generally free of extremists at the time. In spite of my many contacts over my twenty years in India, I hardly ever noticed any priest or religious going beyond the limits of experimentation laid down by competent authority. Reported cases of excesses (such as using Indian chapatis as hosts for consecration) proved on inspection to be either wholly untrue or so exaggerated that they amounted to falsehoods. Traditionalists in India who were spoiling for a fight were forced to support their position with newspaper reports of alleged liturgical abuses abroad. Until the question of the Indian eucharistic prayer and the Indian scriptures arose . . .
As part of the indianisation process, a eucharistic prayer was drawn up by a theological commission, submitted to the Indian Bishops’ Conference, approved by Rome for experimentation, and spread throughout India. The content of the eucharistic prayer was only partly controversial. It followed the traditional scheme of the Roman eucharistic prayer and only differed by the incorporation of Indian terminology. For instance, in the concluding doxology it worshipped God as ‘Ôm, Tât, Sât’. These are terms used in Hindu prayers to acknowledge God as ‘Origin, (ultimate) Reality and Truth’. Moreover, disagreement arose about the permission given to the eucharistic prayer. Had it been supported by the necessary number of votes before being sent to Rome? Had the Liturgical Centre overstepped its competence by publishing a printed text after receiving the Roman approval? While these matters were being discussed by various authorities within the Indian Bishops’ Conference, Rome intervened in 1976 and decreed the suspension of the eucharistic prayer. A second problem was the reading of traditional Indian holy texts before the biblical readings. The ancient religions of India have contributed much to human thought by spiritual scriptures such as the Vedas and the Bhagavad Gita. In the missionary context of India, it was logical to introduce worthwhile passages from these scriptures as an evangelica praeparatio, a preparation for the gospel. In experimentation centres, such passages were read before the readings from the old and new Testaments. In January 1975, a seminar was convoked in Bangalore where theologians and indologists tried to work out the implications of a prudent use of Indian scriptures in Christian liturgy. I took part in the consultation. In a research paper I showed that writings from Egypt, Mesopotamia and Canaan had been assimilated into the old testament. So sacred writings from other sources could be incorporated in the inspired Word of God. Although to my knowledge – and I was a participant of the consultation – the matter was throughout handled in an extremely orthodox manner, without any exaggerated statements being either voiced or printed, the traditionalists pounced on the issue, claiming that ‘Indianisers’ were equating Indian scriptures with the Bible. The letter from Rome forbidding the reading of Indian scriptures at mass even in experimentation centres, although probably meant to allay fears and restore unity, was being interpreted by traditionalists as confirming their stand. The situation was not helped by the emergence in 1975 of an ultra-traditionalist monthly called The Laity. Having apparently no financial limitations, it was sent free of cost to all priests throughout India. Contrary to its name, the articles written in it were supplied by priests who rejected Vatican II and what it stood for. Its journalism was generally of a deplorable kind, consisting mainly in making coarse accusations against leading personalities in the Indian Church. Cardinal Parecattil, Archbishop of Ernakulam, who supported the Indianised Mass, was called “disloyal to the Church” and “a man without brains”. Liturgy seems to be plagued by a demon of its own, a temptation, a ‘thorn in its flesh’. Almost of necessity, it would seem, liturgy breeds liturgical fanaticism. History confirms this. The Church historian, Ernst Wilhelm Benz, comments: “because of the authority inherent in the sacred, every liturgy has the tendency to become fixed in form, and any alteration of the liturgy can thus be regarded as a sacrilege”. Read more about this in my article: ‘Authentic Christian Worship in India. A Search and a Struggle.’ I witnessed in India both the success of true liturgical reform as decreed by Vatican II and the growing opposition by liturgical fanatics.